"Who in their right mind is going to climb into it sober?" Oh, dear. Ultimates. I've read the first series and two issue of the 2004 series and I am enjoying it so much. The cohesiveness of the storytelling is something that I've not gotten from Marvel so far except in Marvel 1602. It's nice. The characters are very different from their counterparts in other continuities, and they're very difficult to love given that most of them lack any redeeming qualities, but I can appreciate these grittier, nastier versions because I kind of enjoy fuckfests of terribleness. And I tend to count characters' flaws as merits anyway. YESSSSS. Has anybody else around here read Ults? I want to read Ultimate X-Men, as well. What else in this universe should I read? edit: OKAY WOW I FINISHED VOLUME 2 LAST NIGHT AND UGH ALL MY FEELS. This series is seriously contending against Marvel Adventures as my favorite. I HURT. edit2: Ugh, I hate the writer/penciller change after Ultimates 2. The art in Ultimates 3 was pretty sexist, and the story didn't go anywhere. Ultimatum is even more sexist and is just depressing. This series has turned into one misery after another, and I feel like Loeb is more concerned with racking up a body count than with actual storytelling. Why are these characters even dying. How does this serve the story. And can Finch stop drawing women in ridiculous poses. Come back to me, Millar+Hitch. Uggghhhh. "This nose has been smashed more times than Robert Downey Junior." 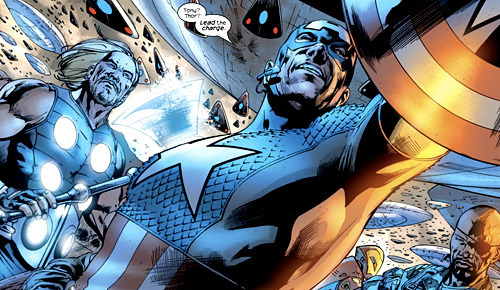 Today I started reading The Ultimates, Marvel's reimagining of the Avengers launched in 2002. I'd tried reading it back in December, before I'd started on Earth-616 or Marvel Adventures, but I was put off by the giant Hank Pym prancing around everywhere, and I think it was hard to get into something so serious when I didn't know any of the characters. This time around, I both know and care about a majority of them, so I'm enjoying it a lot more. Darbles will be aghast, though. She despises Ults and spends a lot of her time trying to convince people to avoid it, myself included. I hope she realizes, though, that Bruce Banner having a Buffy the Vampire Slayer poster in his quarters means that I have no choice but to continue. I'm four issues into the series so far. I've yet to encounter any of the craziness Darbles used to try to deter me from reading, but tbh I was sort of intrigued by a lot of it, and I love grittiness, so I suspect I'll actually enjoy Ults quite a bit.